One of my earliest memories of living on my own in Toronto is of visiting Flying Monkey Natural Foods, near Kensington Market. 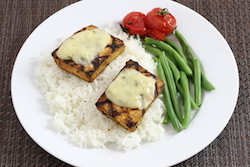 As a naive student with limited cooking skills and time, I made heavy use of their prepared meals. I particularly enjoyed a small but filling burrito filled with the well-loved Indian chickpea curry known as chana (or chole) masala. 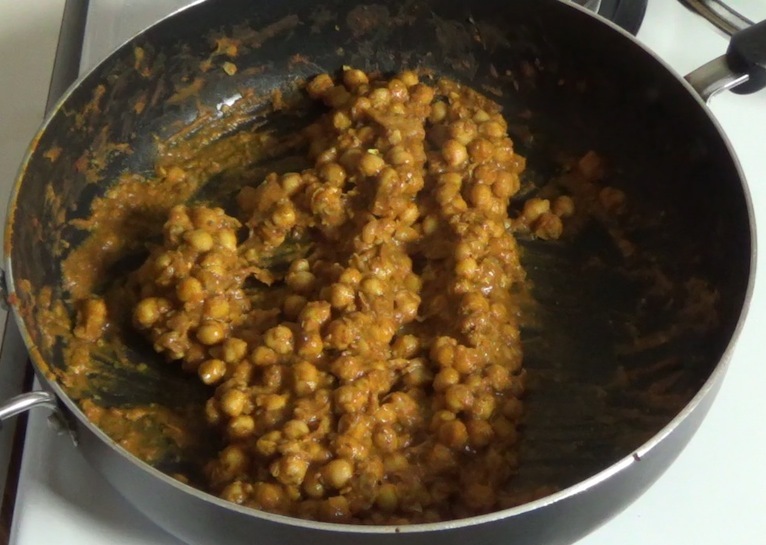 It was thicker than the chana you get in a restaurant, which was a good thing because a burrito made with a thin curry would go everywhere and likely stain your clothes. If ever there was a quick meal designed for life on the go, this is it. 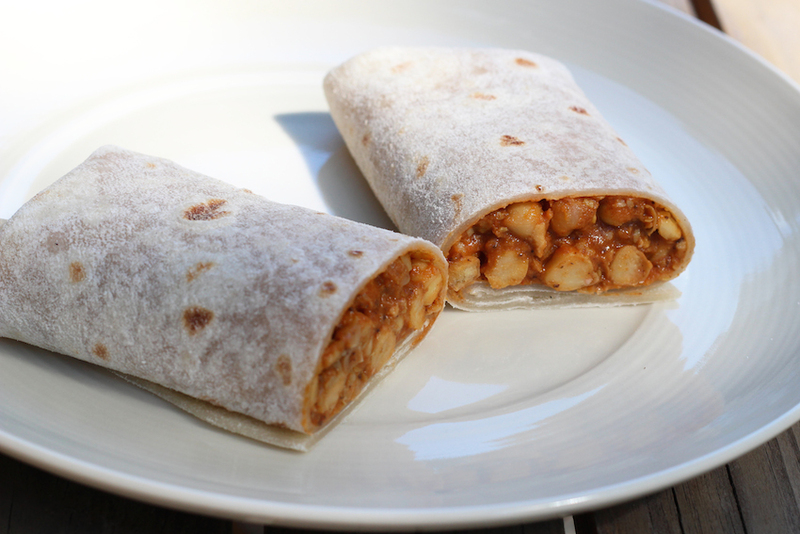 The spices are rich and the chickpeas are filling, but the burrito travels well and waits for you until you're ready for it. 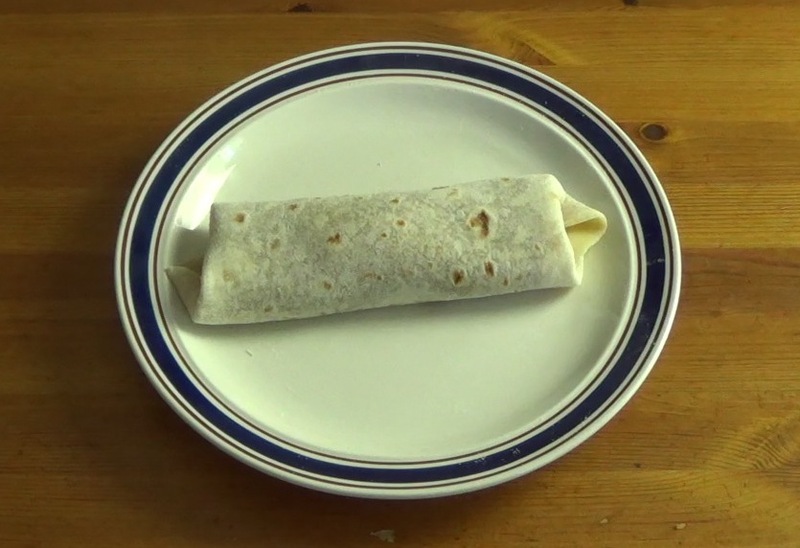 The Flying Monkey doesn't exist on College St. anymore, and I've been unable to find this burrito anywhere else, so I set about making my own. 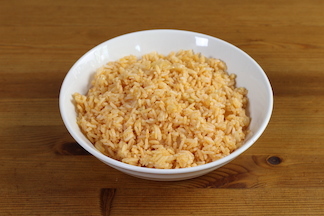 The most difficult part of this recipe is getting all the spices in your kitchen if you don't already have them. 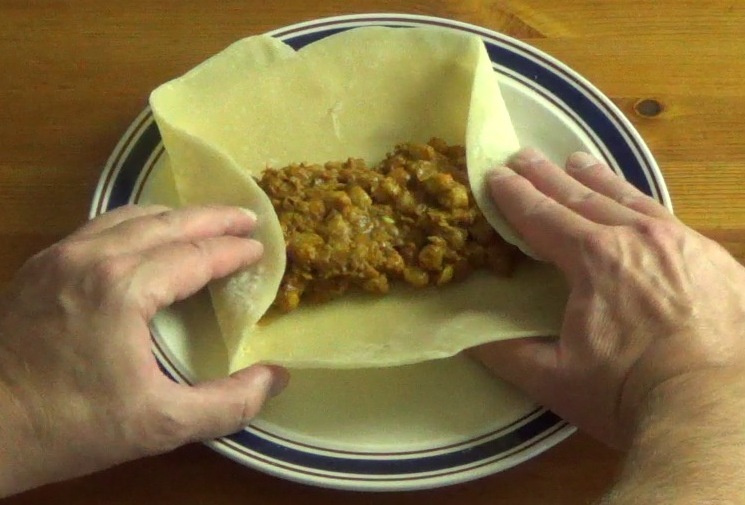 (But once you do have them, you can make these burritos easily, anytime you want.) I'm using homemade tortillas because they're really pretty easy to make and there's no comparison taste-wise. Of course, you can use storebought flour tortillas to make these, but I hope you'll consider the immense freshness and flavour benefits of making your own tortillas. 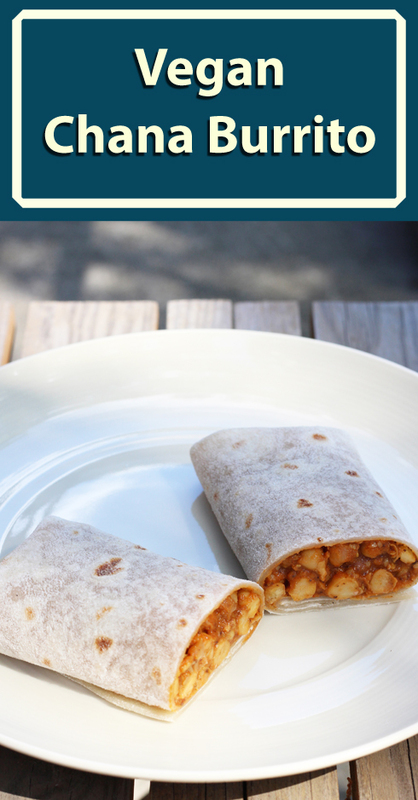 The tortillas and chana can be made separately and stored in the fridge until you're ready to make the burritos. I like them better cold anyway, and that works out well since I usually make them for my lunchbox. 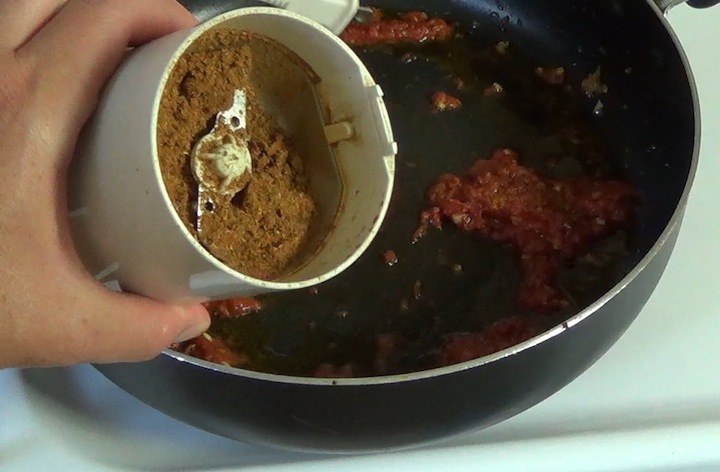 In terms of slightly unusual equipment, I keep a small coffee grinder around just for grinding spices, which is pretty much invaluable for making curries like this one. 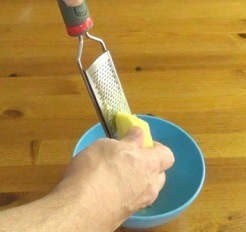 Also invaluable is a small microplane hand grater—it makes quick work of fresh ginger, and as a bonus, you can capture all that delicious ginger juice in a bowl instead of losing some of it to your cutting board. 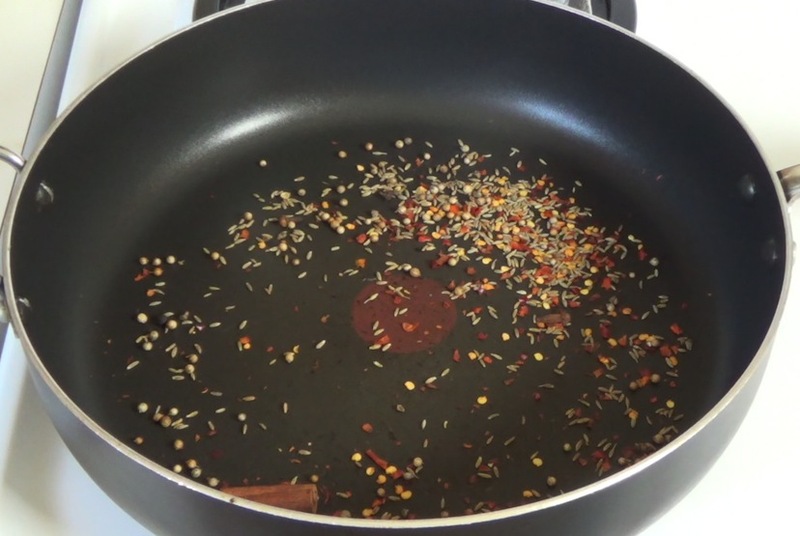 I'm using my trusty skillet with a lid for this recipe. If you don't have one, I suspect a medium saucepan with a lid will give similar results. 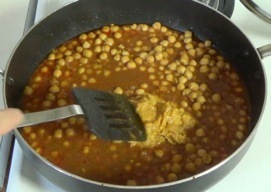 If you've been cooking vegan meals for any length of time, you probably have your own way of preparing chickpeas. I've described my way in my hummus recipe if you are interested. 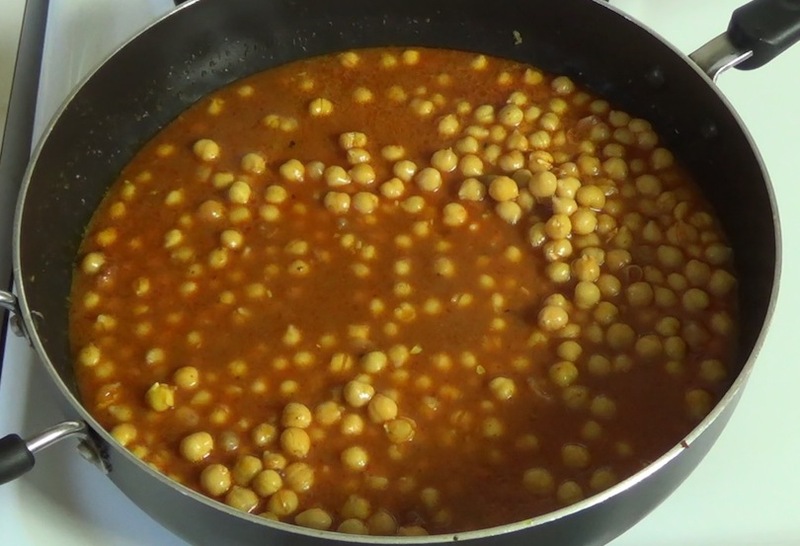 This recipe starts with 1 cup of dry chickpeas, which yields a little over 2 1/2 cups of prepared chickpeas or a little more than a pound (450 g). 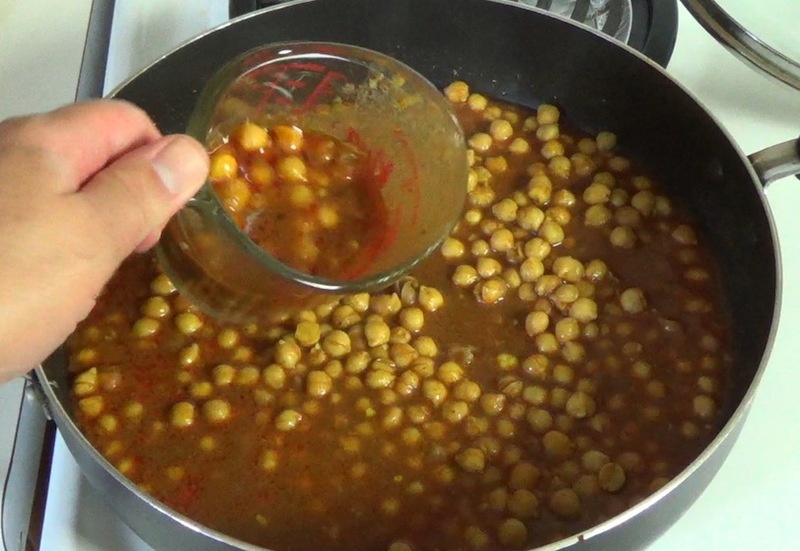 If you're using canned chickpeas, a drained 17 fl. oz. 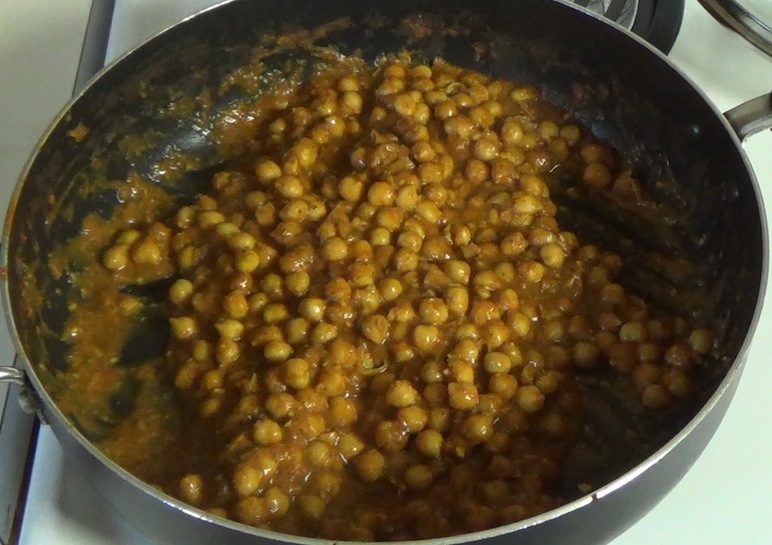 can contains a little less than 2 cups of chickpeas, so you'd need about 1 1/3 cans to get to the same amount. 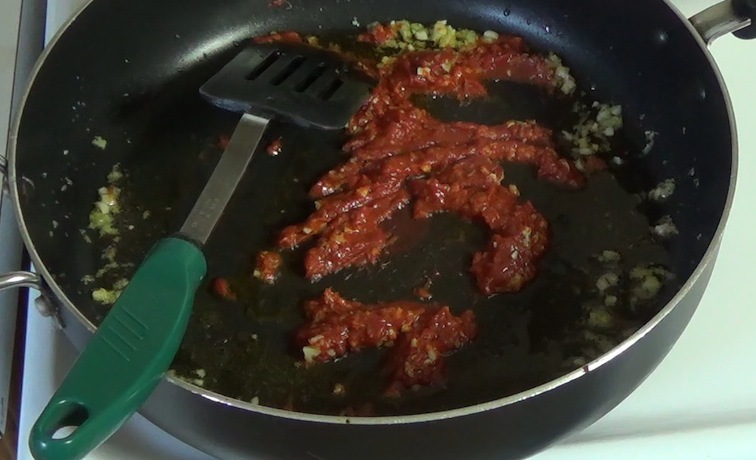 Heat up the dry skillet over medium heat. Cut open the cardamom pods and pull out the little black seeds, discarding everything else. 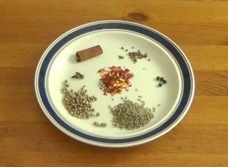 Gather up the remaining spices (except the turmeric and salt) on a plate. Put the spices in the skillet and toast them for about 3 minutes. Keep them moving so they don't burn. 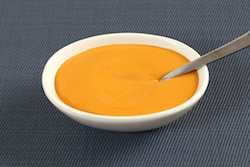 Return them to the plate to cool down a bit. 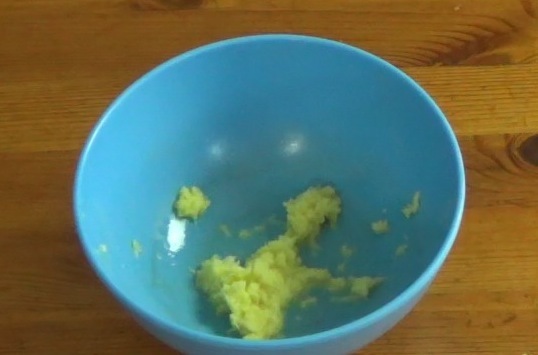 Grate the ginger into a bowl. 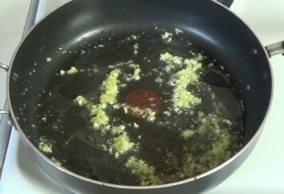 Add the canola oil to the pan along with the ginger and minced garlic. Saute 2-3 minutes over medium heat, then add tomato paste and turmeric and mix well. Grind the spices in a small grinder and mix them in. Add chickpeas, water and salt. Mix everything together. Cover pan, reduce heat to medium-low and let cook about 20 minutes, stirring occasionally. After 20 minutes, remove about 1/2 cup of chickpeas and liquid, allow to cool a bit then blend well in a food processor. Return the blended mixture back to the pan and mix well. Continue to simmer uncovered, 20-30 minutes, stirring occasionally, until the sauce is very thick. 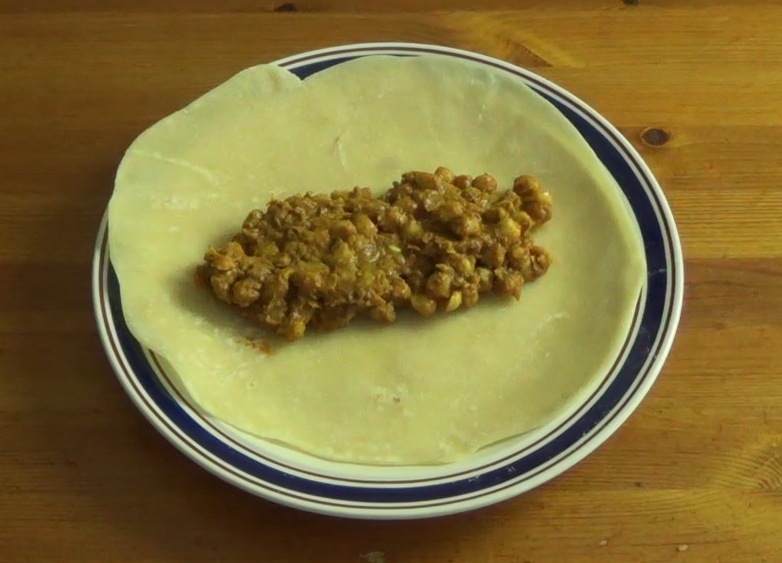 It should be just a little bit thinner than peanut butter when done so that it holds together in the tortilla. 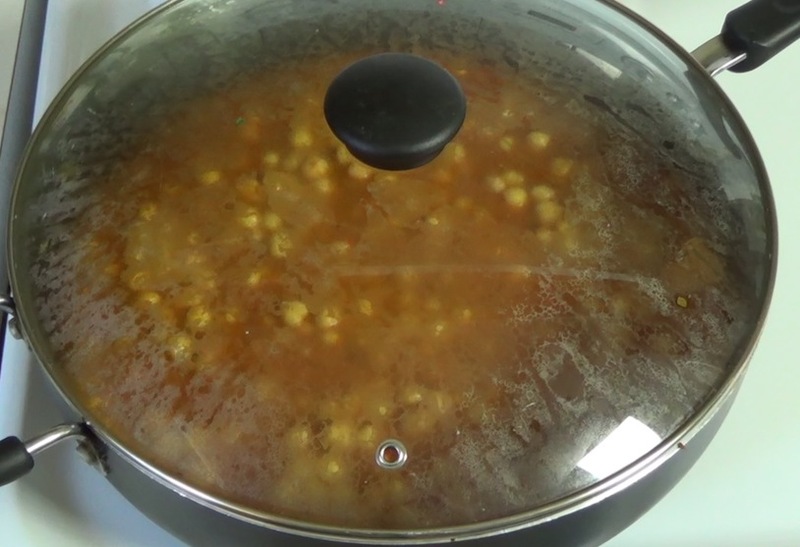 Let the pan cool, then optionally refrigerate the chana until ready to make burritos (they work just fine cold). 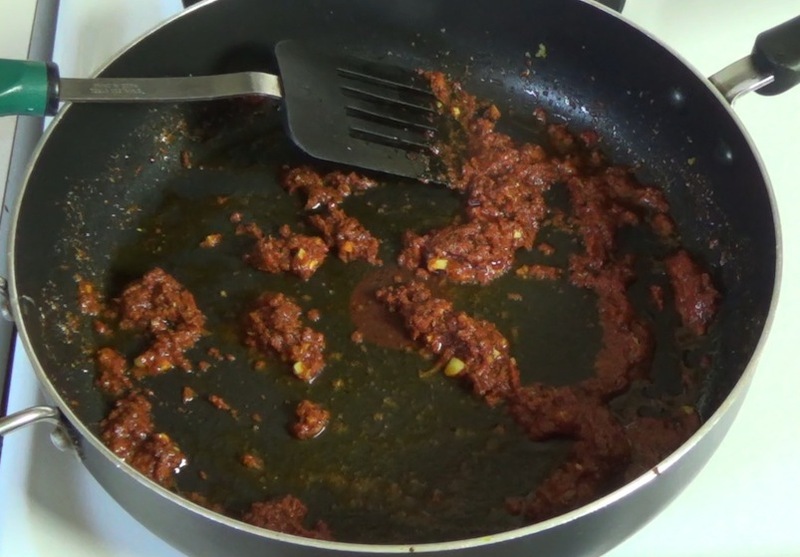 Make the burritos in the usual way. 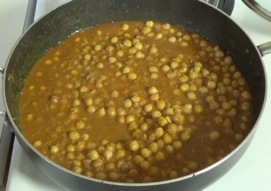 Spread chana on the inside of the tortilla. 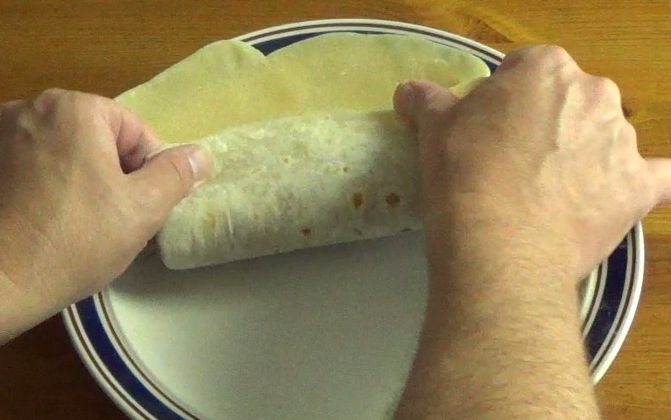 Fold the ends of the burrito in with your fingers and bring the edge of the tortilla closest to you over the top of the filling. Continue rolling until you have a burrito. 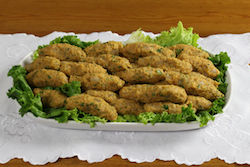 Cut in half if desired, wrap in plastic wrap if travelling, serve cold or hot.